Going into Thursday night’s matchup against the Atlanta Reign, the Boston Uprising looked to come out strong in the first week of stage 2. 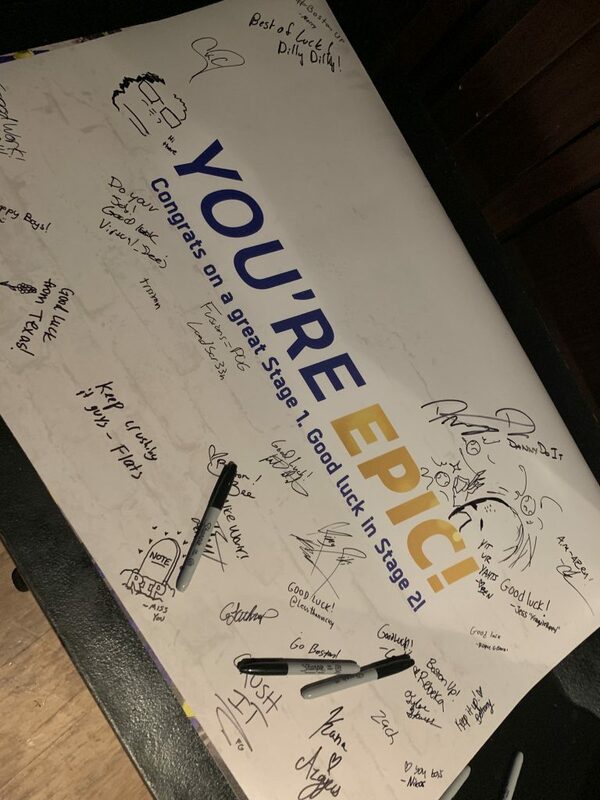 On the other side of the country, Boston Uprising’s staff were similarly looking to come out strong with their first watch party in Worcester, MA. While the team had hosted two standing room only watch parties in downtown Boston (and one in Foxboro) – Worcester was the team’s first foray outside of the Boston metropolitan area. 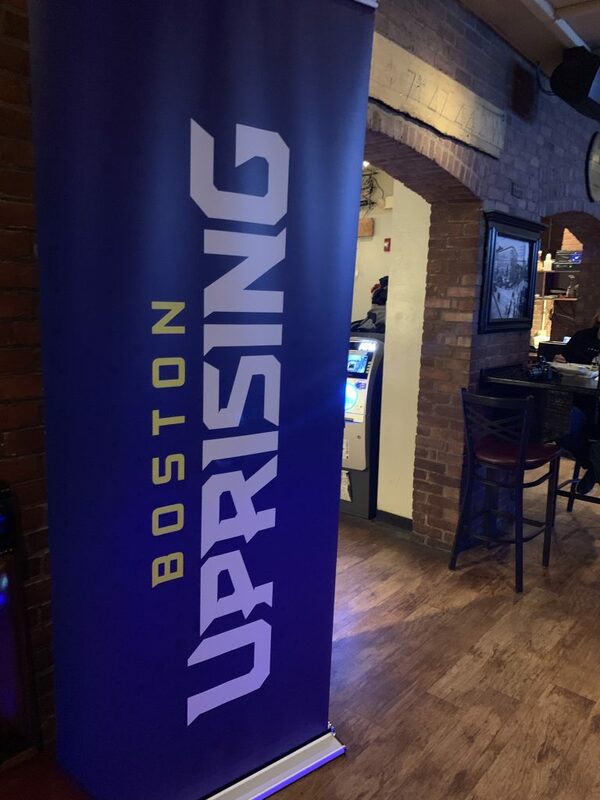 Would Uprising fans come out hyped to support their team outside of Boston? Their was certainly an eclectic mix of characters at the Compass Tavern in Worcester, MA. College students rubbed shoulders with a dad and his teenage son. A young man, clearly dragging his girlfriend to the event, donned a custom Uprising jersey for the night’s festivities. A young woman, clad in a bright DVa sweatshirt, sat awestruck as the broadcast began. But why does the Uprising organize these events and try to get fans to come out for something they can watch at home? I spoke with Julia Pagliarulo, Media Relations Coordinator for the Kraft Group (owners of the New England Patriots, New England Revolution, and Boston Uprising). For the organization, these watch parties serve as both marketing and community development. “We’re a new team and we’re trying to spread brand awareness and let people know about the team” she said. Watch parties have an added benefit of getting fans more engaged with the team. 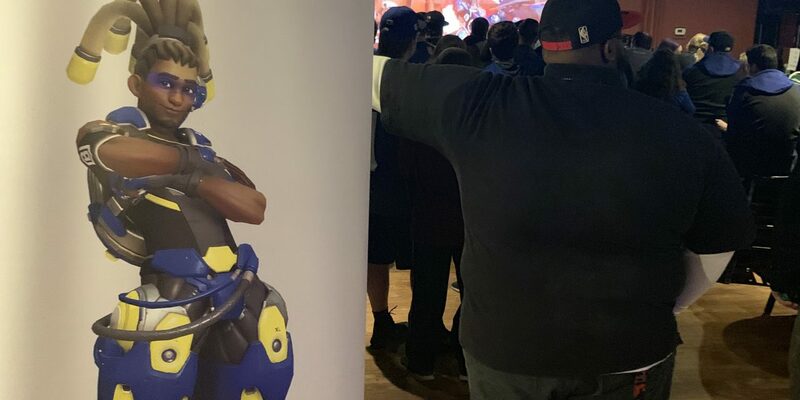 Looking at the fans that had turned out, Julia said, “fans having the opportunity to come out and support the team fosters a strong fan community and means a lot to the team themselves.” Nearly every attendee sported an Uprising hat, shirt, or other apparel. The night had clearly drawn fans that were all dialed in. Fans got plenty for themselves coming out for the event, too. A banner being sent straight to the team was available for fans to sign. Plenty of posters, sunglasses, and stickers were free for attendees. Lastly, fans had a diverse array of standees and cutouts to use at a free selfie station. If that wasn’t enough, the night’s national broadcast cut to the party just before halftime. So why did the Kraft Group pick Worcester to host an event? “We thought having several colleges in the area – WPI, Worcester State, Clark, and being easily accessible made it a great spot” Julia said. While New England is rife with college towns, expanding into western MA was the Uprising’s first priority. Not that the Kraft Group isn’t interested in towns outside Massachusetts. “We don’t want anyone to be too far from a watch party” she said. What role do watch parties play in fostering a fan base that the Kraft group hopes will turn out for a 14-game regular season home schedule? “We really want to support the fan’s engagement and hope by giving opportunities like this more and more fans will commit to supporting the team” Julia said. Boston, like every other team in the league, has to foster a fan base they hope will fill whatever arena the Uprising play in. Getting the fans out, meeting each other, and interacting with the players and staff is a great start. Fans who came out Thursday night were treated with an exciting match against the Atlanta Reign. After going down 0-2, the Uprising came out of halftime and pushed it to a fifth map. Coming out to meet up with other fans, with the rest of the place emptied out, on a weekday night, and the clock hitting 10:30pm, the Uprising faithful were rewarded. Boston completed the reverse sweep and started Stage 2 with a perfect record. 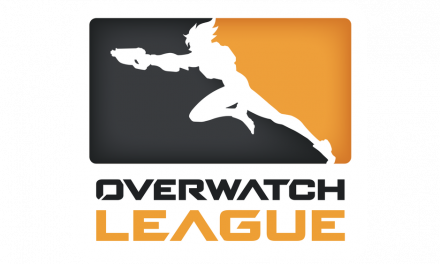 With that type of momentum, the future looks bright for both the Uprising and their fan community. On the way out, I spoke with a father I had seen all night having the game thoroughly explained to him by his teenage son. I asked him – what did you think of the night? “I don’t completely understand everything that happened, but it was exciting. [My son] had a great time and it was nice being a part of it with him” he told me. Would you come out again? “Oh yeah. He wants to go to a home game next year and after tonight, I told him I’d go with him” he replied. After Boston’s fans turned out for a well-received watch party, it’s hard not to think something special is happening. The team has the fan community to do something special, especially once home matches start. You could even call it an Uprising. PreviousIs Brad Friedel on the hot seat already?